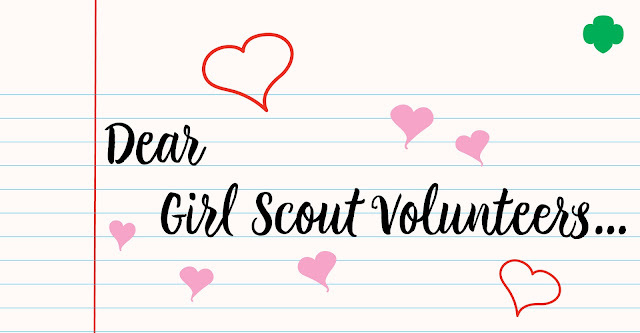 Girl Scout Volunteers, We Love You! That’s right—we’re talking to you, our extraordinary volunteers, who tirelessly give of their hearts and time to help us unleash the leader in every G.I.R.L. (Go-getter, Innovator, Risk-taker, Leader)™. This Valentine’s Day, we want you to know that we see you, we appreciate you, and yes—we love you! We know we don’t say it nearly enough, but we didn’t want today to go by without letting you know how we truly feel. Valentine’s Day is about friendship, and that’s what you provide. It’s about community, and that’s what you build. It’s about sharing your heart, and that’s exactly what you do—without limits and without hesitation. You’re the real MVP! So when you’re tired and running around coordinating meetings and events galore, and losing a little steam, we want you to remember this: every day as a Girl Scout volunteer, you power life-changing adventure, opportunity-rich learning, and powerful growth for girls who will become the leaders and happy, healthy, problem-solvin’, barrier-breakin’ change-makers our world needs. And while they’re having the time of their lives making forever friends and trying new things, they’re learning that anything is possible. Their confidence is rising, and they’re breaking through fear. They’re raising their hands, sharing ideas, and believing in their own inherent power right from the start, all because you show them every day that’s it’s there. By walking beside them, letting them lead, and supporting them unconditionally, you’re not only talking the talk—you’re walking the walk. And what a walk it is! Don’t ever let anyone suggest that being a Girl Scout volunteer is no big thing. It takes grit, creativity, leadership, vision, and so much heart. We’d be nothing without you, and we want to thank you, from the bottom of our green green hearts, for showing girls that the world is theirs to take on. Between the power of your guidance and our proven Girl Scout Leadership Experience, there’s no challenge our girls can’t overcome, no goal they can’t reach. So today, we celebrate you and the priceless love you give girls every day through your unwavering dedication to their success. The future is bright, and you’re lighting the way! And just for good measure, we’ll say it once more: WE LOVE YOU!